Dollars into Sense: Welcoming the New Year. 1. Pay off debt. The cost of Christmas causes many families to use a credit card. For many of us “the joy of giving” often turns into sadness when we see our credit card statements in January. If times are lean pay the minimum amount due on each credit card before the due date so no late charges will add to the balance. Check the interest rate on the card and dedicate any money you have left in the budget to paying off the card with the highest interest rate. Credit cards have a huge impact on your financial fitness. For each dollar charged on a credit card, the average consumer pays back 112 percent. That means for each $100, they end up paying $212 for principal, interest and fees. Paying off these debts will make a huge difference in your finances and will also ease the emotional stress that often comes with credit card debt. 2. Put aside an emergency fund. This maybe very difficult for a lot of individuals out there, especially with the unemployment rate still hovering around 10%, put aside as much as you can. The average emergency cost that causes consumers to use credit cards is $2,000. By having this much money in a savings account, you will save the interest and reduce further debt. Dedicate any money you can squeeze out of your expenses to this fund. Save $150 per month for thirteen months or $75 for 27 months to get close to that $2,000 target. 3. Make a spending plan or a budget. Knowing where your money goes is the first step to good money management. No matter how much you earn, you can always benefit from a spending plan. Keep track of where your money is being spent. Use a checkbook register, bills and bank records to organize expenditures. Then examine them to make sure this is how you want to spend your money. The beginning of the year is the ideal time to do this, since most credit card companies will be sending year –end statements that will breakdown all of your spending for the last year, often the charges are broken down by category and by month. It’s the perfect opportunity to look back on the things you spent money on in the previous year and will give you an idea on the things you can cut back on moving forward. 4. Reduce spending. After creating a budget, take a look at how much you are spending and see if you can reduce it. You might find you are spending money eating out, on movies or hobbies. Look for ways to reduce spending and you’ll have more to add to an emergency fund. 5. Improve your credit score. As money has tightened in our economy, your credit score is extremely important. Your credit score ranges from 300 to 850 with a minimum of 700 to apply for a credit a card or to get a favorable interest rate on a mortgage. Your credit score also can determine what you pay for insurance, cable TV and rent. Your credit score reflects whether you pay your bills on time, how much you owe, your credit history, the type of credit you have and the amount of credit you are using. Three major credit agencies maintain credit records: Experian, Equifax and TransUnion. You can request a free report of your credit record one time per year from each of these companies at annualcreditreport.com. I often tell people to get one company’s report now and work on improving your report. In four months, request a report from the second company and continue to work on your scores. In four more months, request a report from the final company. This will give you an accurate look at how your score is improving throughout the year. 6. Review your income taxes. If you have a change in the number of people in the family or your income, look at your tax withholding. If you take out too much, you are giving the government a tax-free loan. If you take out too little, you’ll be faced with a whopping tax bill and might even have to pay penalties and interest. 7. Be accountable! 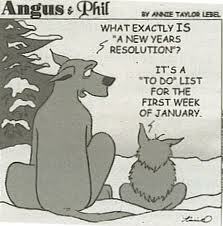 It’s easy to make resolutions; the hard part is keeping them. Take the time to actually type them out or write them down on a piece of paper and keep the list somewhere you can see it everyday. Also, share your resolutions with some of your closest friends and family, people that you see or speak with frequently, that way they can ask you about your resolutions as the year progresses keeping you more accountable. I know, that for many of us 2010 came with a lot of ups and downs. Most people I come across are looking forward to seeing the many experiences that this year has given them in their rear view mirror. I am both hopeful and optimistic that the turbulent year that was ended with more optimism than dread. For the many that have seen some of their darkest days in 2010, I hope that 2011 will be a reminder that “The Sun Also Rises”. To my small handful of readers and followers, I want to thank you for supporting me and my blog that I started this year and will hopefully continue to go strong in 2011. I wish all of you a very healthy and prosperous New Year. #1 check, #2 check, #3 and #4 working on it, #5 check (phew! ), #6 check and #7 is excellent advise that I resolve to take! I wish you a healthy and prosperous New Year as well! You're ahead of the game! A very healthy and prosperous New Year to you, NB and CB!